The Custom Software Applications Development (Business Software Development or ERP – Enterprise Resource Planning) and Mobile Apps Development division exceeds 10 years experience in delivering solutions for clients in Europe, USA or Canada. We strongly believe in the power of custom web development, to be able to address the customers’ needs and to organize their business in a unique and personalized way to make profits. 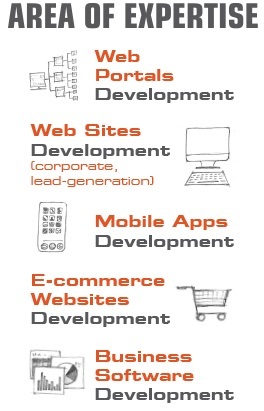 Our development methodology is a result oriented one. Having a team of dedicated professionals and experts with years of experience in the industry, we are able to understand your company and propose the best solutions. The process is carefully planned and executed according with the latest principles in the field (agile/scrum methodology). We use open source technology in our project (PHP, MySQL). We are proud to deliver high results oriented services to more than 500 clients worldwide. All functionalities of the web application/mobile app is documented in the “Analysis document”. We use every pixel for conversion having in mind a visual appealing interface with attractive mix of text, photos and graphic, providing easy electronic access to public information. You will receive a powerful CMS or a Mobile App that will allow you to easily update the content by yourself. The project manager assigned by us will make a comprehensive analyze of your company, target audience, competition, objectives, addressability, visual elements, the current website, your activity, similar websites from your country and abroad. You will find below a marketing questionnaire, with key questions that allow us to find out your differentiators, your key advantages which are going to influence your new website design and functionality. Which are the products / services you want to promote? Which products / services are best sellers? Which is your main competitive advantage? Product / Service purchase is repetitive? What is the % of each product/service category in the total turnover? Do you have seasonal picks ? What is the returning time period for a new purchase; does people do the new purchase in a specific period of the year? This document will be sent to you in order to be revised and based on the mutual agreement on features, we will use this document for the website design for front page and all interior pages. Customers and prospects desire fast, quality web experience on any browser, device, technology or netwoek they could use.